Works in siciliana rhythm appear occasionally in the Classical period. Joseph Haydn, perhaps inspired by the bucolic associations of the genre, wrote a siciliana aria for soprano in his oratorio The Creation, "Nun beut die Flur das frische Grün" ("With verdure clad the fields appear"), to celebrate the creation of plants. For Mozart, the hesitating rhythm of the siciliana lent itself to the portrayal of grief, and some of Mozart's most powerful musical utterances are tragic sicilianas: the aria for soprano "Ach, ich fuhl's, es ist verschwunden" from The Magic Flute, the F sharp minor slow movement of the Piano Concerto, K. 488, and the finale of the String Quartet in D minor, K. 421. 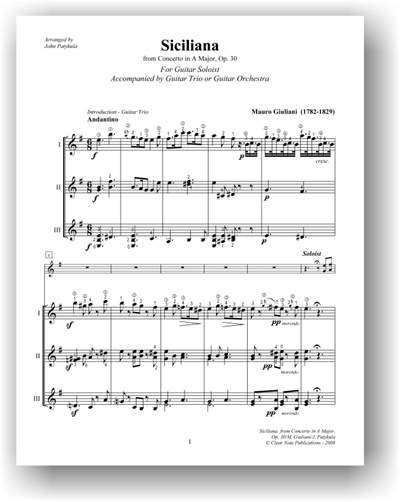 The third movement of Domenico Cimarosa's Oboe Concerto is a siciliana. Other examples of sicilianos are featured in the last movement of Carl Maria von Weber's Violin Sonata No. 5 and the second movement of Anton Reicha's Clarinet Quintet in F major, Op. 107. 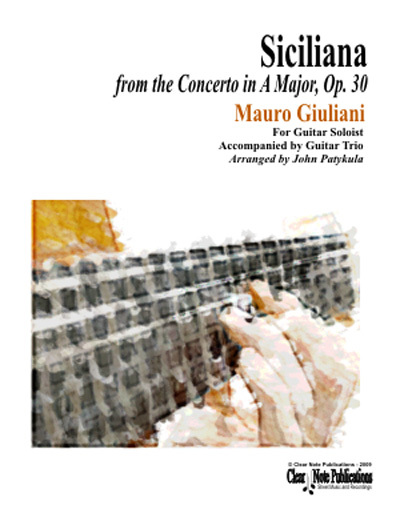 The 18/19th century guitar virtuoso Mauro Giuliani (1781-1829) was also very fond of the siciliana form and frequently composed in it. His most notable example is found in his First Guitar Concerto in A major op 30, second movement. The opus 30 concerto is in the usual three movements. The first, Allegro maestoso, is a sonata-allegro based on two genial themes, both of which have a playful, Rossini-like cast. Once the orchestra presents the tunes, the guitar takes them up and develops them with a variety of embellishments and much technical display. The second movement, an Andantino, is marked Siciliano. It begins with a melancholy theme in the minor for strings, later taken by the guitar. Interestingly, the charming second tune is in the major, and the movement continues in the major to the end. A sprightly refrain opens the third movement Allegretto, a polonaise.